You want to have Sunday brunch at a beautiful spot in Prague? You don't want to spend a lot? 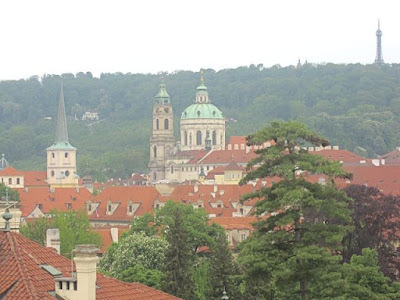 Dining in fancy digs like the InterContinental's Zlata Praha or the Radisson Blu's La Rotonde will cost you more than 1000 CZK per person on any given Sunday. Depending on what you drink, it could cost a lot more. But there's a cheaper way to go. 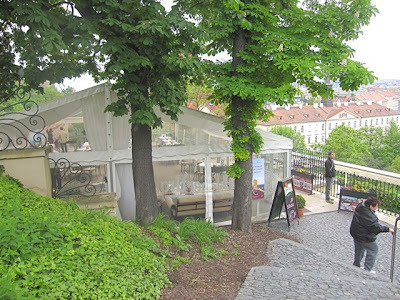 Recently, a bunch of my friends decided to meet for brunch at Villa Richter, near Prague Castle. 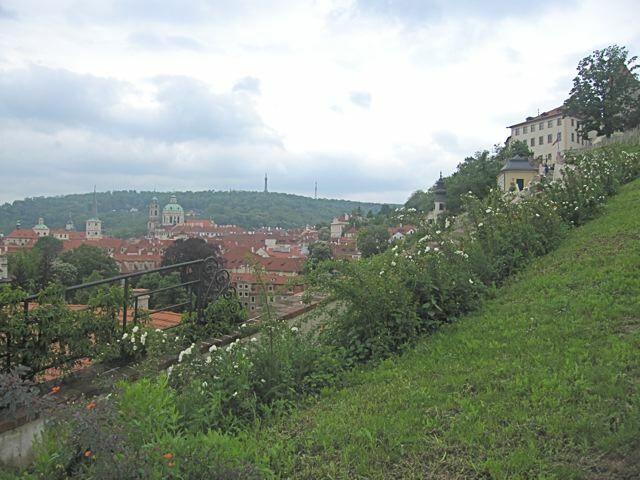 The cost per person: 400 CZK. On the appointed day, I went to Malostranská metro station and walked the short distance to bottom of the Old Castle Steps. That's one of the entrances to Villa Richter. 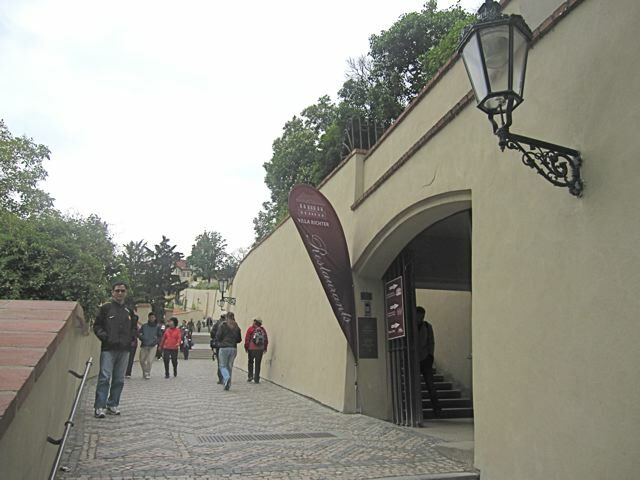 You can also get there by walking out of the Prague Castle exit near the Golden Lane. From the steps, there are quite a few stairs to climb up through a small, working vineyard. 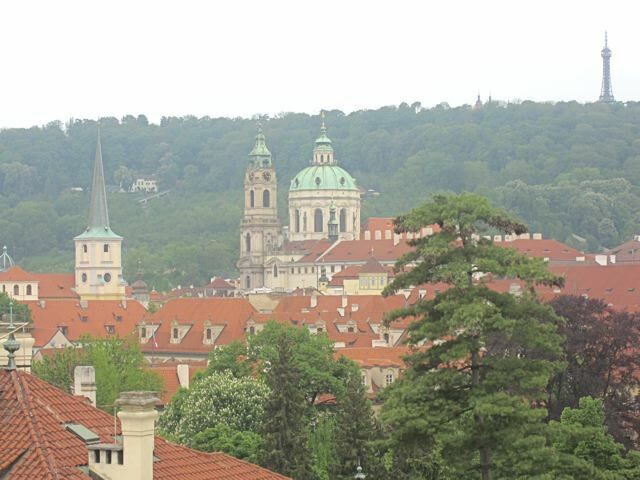 There's a great view of Mala Strana and the St. Nicholas church. 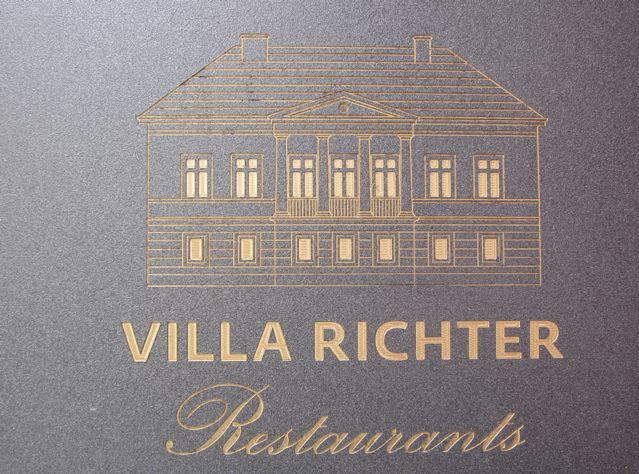 Villa Richter has a number of different dining and drinking options. There's the Panorama Pergola were you can get Czech wines and light snacks. 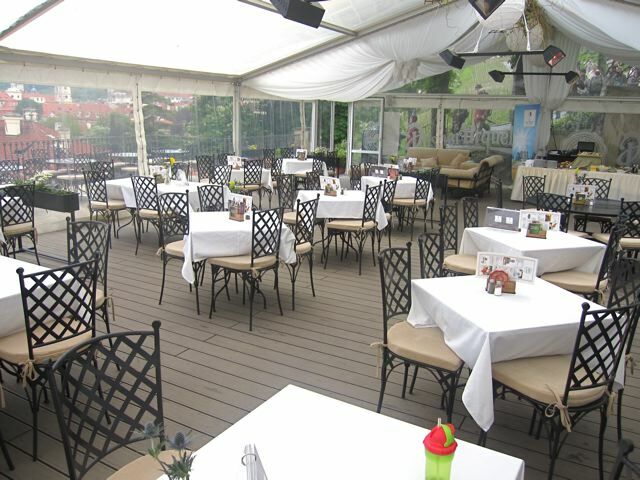 There's also the Piano Nobile restaurant, which is the upscale option. I've never eaten there, but I've heard both positive and negative reports about it. Below that is Piano Terra. 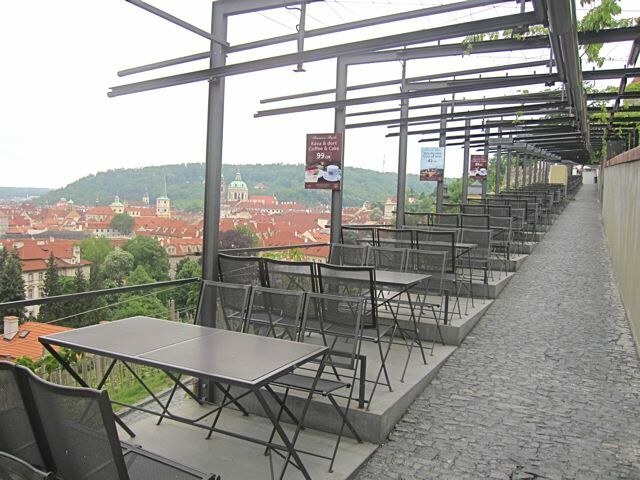 That restaurant has a terrace where they have the brunch. 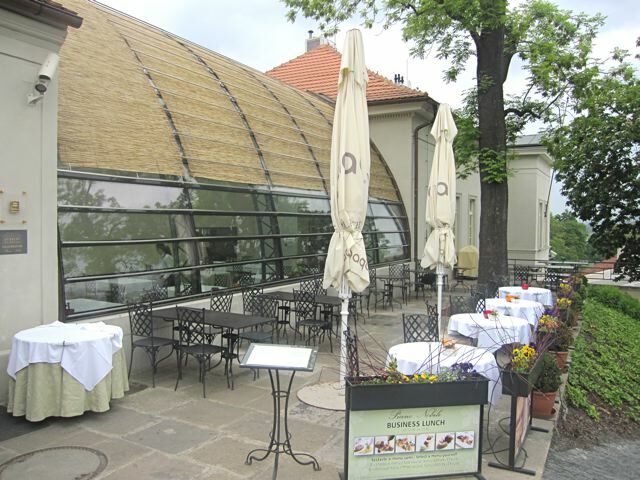 It has a roof over it and clear plastic walls that can be opened in good weather. 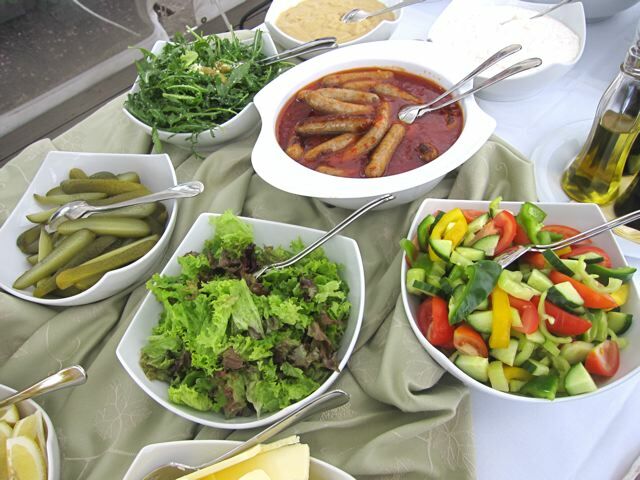 Most of the food was served buffet style. Don't expect anything too gourmet at this price point. There's quantity if not always quality. It's all you can eat. There were salads, including rucola, pickles, and sausages. 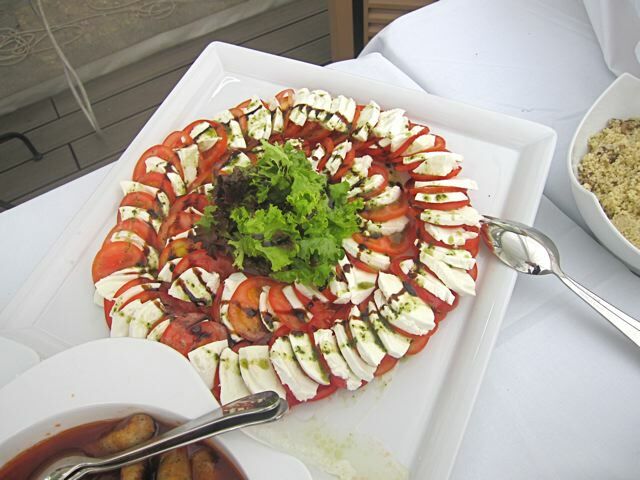 There was a nice spread of Caprese. One of my favorite options there were the cheeses. 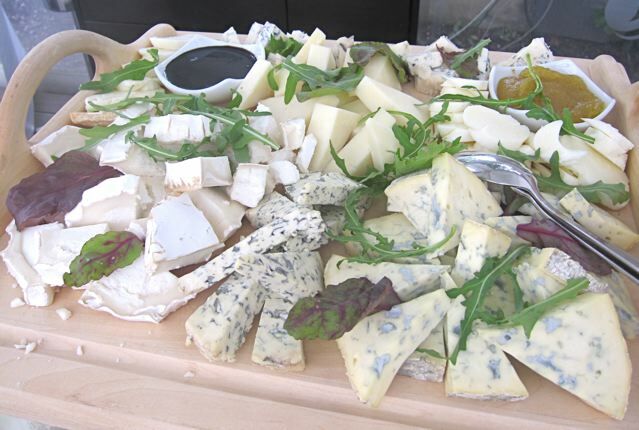 They offered a wide variety and some were excellent. 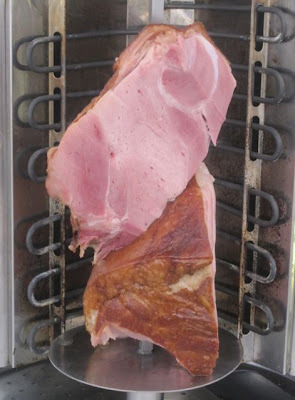 The best warm option was the ham, which a chef carved off a rotisserie. 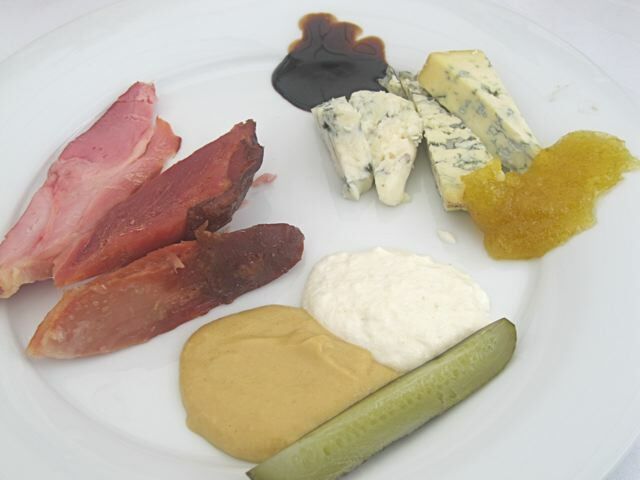 I had this tender, smoky meat, along with the cheeses. On the side, there was balsamic syrup and a very spicy, sweet fig sauce. Everyone who could stand the serious sharpness of this sauce really loved it. There were several other hot dishes served from heating trays. These were less successful. 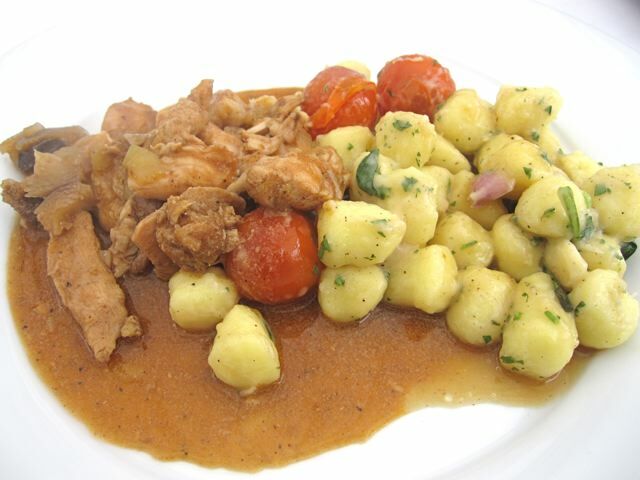 The chicken and pork ragout had great flavor, but the meat was tough and overcooked. I had it with mushy gnocchi that tasted like balls of mashed potato. Meh. 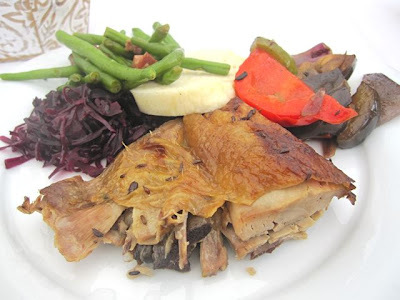 There was roast duck with red cabbage. It had a soggy skin and the meat was overcooked. The cabbage and green beans on the side were good. 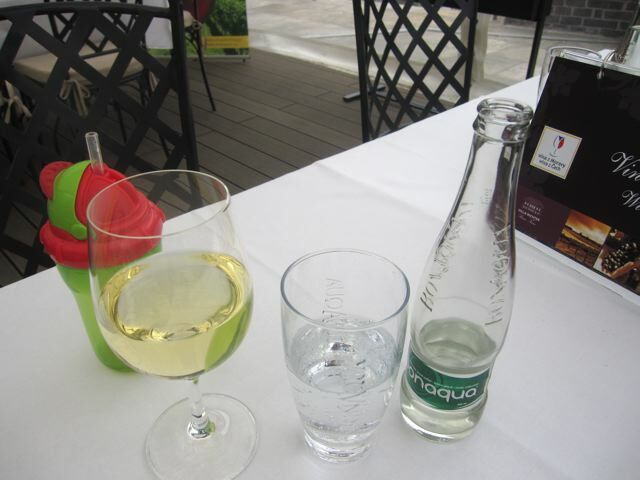 I wasn't drinking that day so I ordered a bottle of water. The price of that tiny bottle of Bonaqua really surprised me at the end. It was 59 CZK. Friends said the wine they had was good. I didn't catch what kind it was. 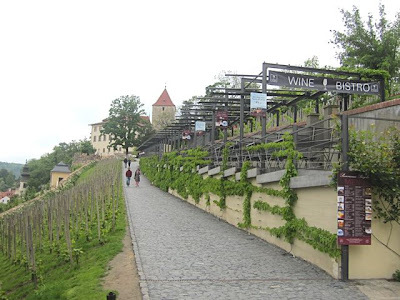 But .15 liter glasses of Czech wine can run from 81 CZK to 115 CZK. I also didn't get the price of the Bloody Mary my friend had, but I can say it was not worth the money, whatever it cost. It was bloody awful. 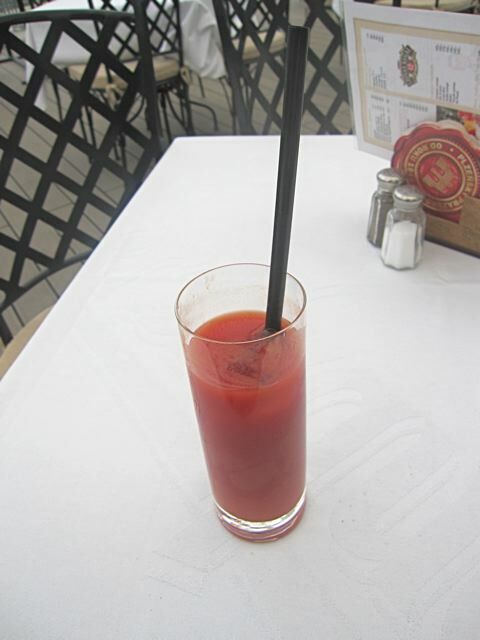 It tasted like it was just tomato juice, a little Tabasco, vodka, and a few ice cubes. Totally boring and bland. The desserts were a mixed bag, with a few bright spots. The blueberry cake was dried out. 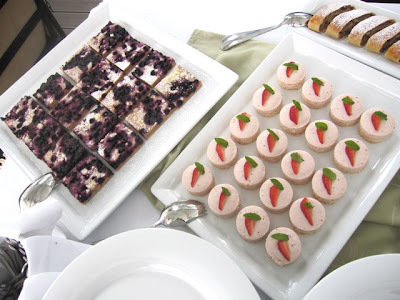 I didn't try the circles of strawberry cream cake. The Medovnik (honey cake) was standard, but fresh. 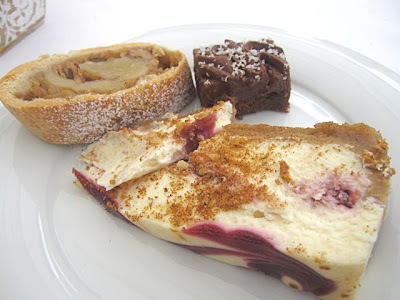 The cheesecake was not American-style, but it was sweet, gooey, and still tasty. 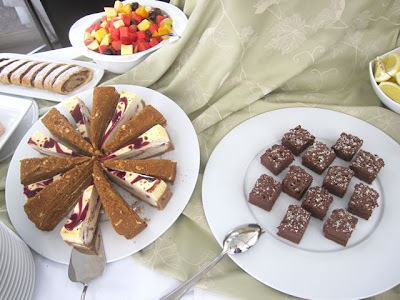 The squares of chocolate mousse-like cream on top of chocolate cake were intense, rich, and my favorite. I had a couple of those chocolate devils. But the apple strudel was seriously dried out. Nobody liked it. So I'd disagree with Mr. Paine. It is not only dearness that gives value. If you don't drink too much at Villa Richter, you get a filling brunch at a restaurant with one of the best views of Prague. The food is certainly not anything special. But I'd recommend this brunch, especially for visitors, because it is relatively cheap. And to me, that's what gives it value. Thanks for the reviews. We visit your blog every week or so looking for places to eat during an upcoming trip to Prague.